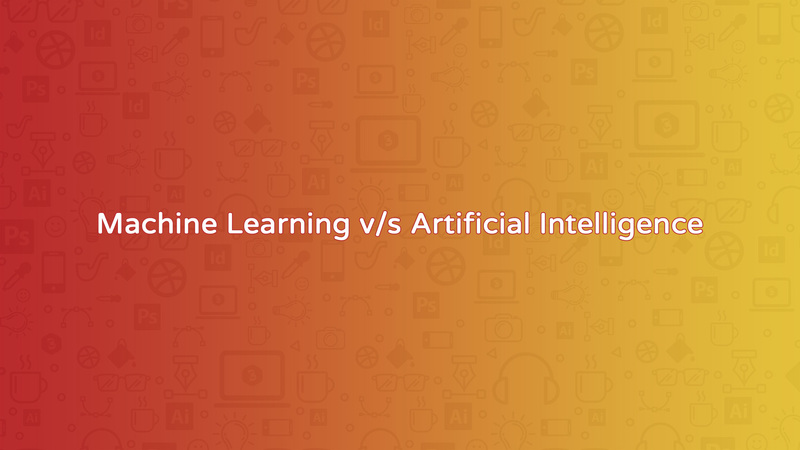 In this article, we will discuss Machine Learning v/s Artificial Intelligence. Even though Machine learning and Artificial intelligence are very closely related technologies, but there are certain differences, which we will be able to learn from the following article. Especially, AI is based on logic factors and machine learning is based on machine and algorithm factors. You can use AI in the machine as well as web applications, but ML is a machine or computer-based program. Let’s have the glance on these two technologies. As many readers know machine learning well as the best algorithms for monitoring the computers or machines. Deep learning is a sub-division of machine learning, which refers to artificial neural deep networks, and reinforcement learning. You can find Artificial intelligence anywhere like in your pockets and on your screens, etc. Intelligence helps in finding a right thing and right options and ultimately becomes beneficial for the needy person. With the use of Artificial Intelligence technology or tactics, Robots are able to challenge human being in several cases by saving time and money from spending on human powers. But, machine learning technology is the basic part of the robot that detects the data or status of computers and other digital machines and provides the exact report. Machine learning also works with IOT technology and several web applications with a great digital based true output. But, Artificial Intelligence works on decision making by fetching the input information with the verified database and decides about the right action or permission. Hence, both technologies have justified their importance in IT sectors and computerized industrial sectors. Thus, Robots perform excellently with the use of Machine learning algorithm and Artificial Intelligence and other necessary technologies. Deep learning empowers the neural parts of robots by providing a best deep artificial neural network with algorithms. This network has built up new records incorrectness for many significant issues, such as recommender systems, image, and sound recognition, etc. For instance, deep learning is the section of DeepMind’s famous AlphaGo algorithm that beat the Ex-champion Lee Sedol at Go in 2016, and the recent world champion Ke Jie in 2017. In sports like Chess, the Robots perform well in defeating the grand masters by using Artificial Intelligence. Hence, with the deep neural network, the machine learns well and with Artificial intelligence, it decides well. Artificial Intelligence technology is the ability of machines to perform tasks like intelligent human being. These types of things include planning, blueprint recognizing, considering natural language, reading and solving issues. Generally, there are two types of Artificial Intelligence: genuine and narrow. Our on-going technological competence falls under the Genuine Artificial Intelligence. Narrow Artificial Intelligence executes a sliver kind of intelligence like human or animal. Hence, the expertise of this machine is narrow AI. Especially, this type of AI will recommend images or search through databases quickly. Similarly, you can follow different methods to develop machine learning project such as Supervised, Semi-supervised, Unsupervised, Deep and Reinforcement learning. In this method, the computer application takes labeled data and then assigns a proper parameter to them. Preceding this, this application uses its algorithm to verify the unlabeled images through its past data. This learning method doesn’t include any basic labeled data. Reinforcement learning is a subset of machine learning and comes with rules. For instance: game of Chess. Deep is simply a technical term that refers to the different layers in a machine neural network. A shallow neural network has one hidden layer, and a deep network has multiple hidden layers. Several hidden layers enable deep machine neural networks to study the features of the hierarchical data because the two pixels based features recombine from one layer to the next layer, to build up more composite features, for example, a line. Hence, many industrialists use Deep machine learning for computer learning purpose. Machine learning is an algorithm for studying computers without being plainly programmed. But, AI is a properly programmed technology to execute certain fruitful output. For instance: through Python, you can write complete machine learning project without coding. In sum, the readers must get some valuable idea between machine learning and AI from the above article. Machine learning is a valuable subset of AI but AI is not a subset of ML. That’s why all machine learning programs are AI based. For example, symbolic logic like expert systems, rules engines, and knowledge graphs are AI programs, and not machine learning projects.